Over the first 3 months of 2012, our sources show instances of Stages 1 (Classification) 3 (Dehumanization) 4 (Polarization) and 5 (Preparation) of Gregory Stanton’s Eight Stage model of the genocidal process. 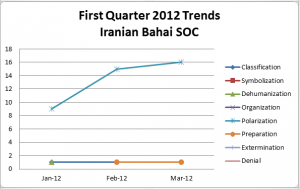 Events and analysis of this quarter were highlighted with concerns addressing the judicial processes in Iran, the aggravating effects of economic sanctions, systematic propaganda, and the targeting of prominent Bahá’í leaders and activists. The rumoured connection between Iranian security forces and their logistical support for Pro-Assad security forces in Syria in the March 2012 report was corroborated as fact in later reports and elaborated upon. The situation in Syria presents a political mirror for the case in Iran, and we will be watching any future developments with this connection very closely. Please stay tuned for further quarterly summaries and reports from 2012 and 2013. Follow the twitter hashtag #IBSOC for real-time updates and future notifications for new reports and developments from this SOC.